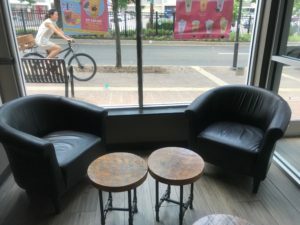 Kung Fu Tea, with over 150 stores worldwide, has been a popular place for College Park residents, students, and visitors, for the the past two years. It is located on Baltimore Avenue, in downtown College Park. 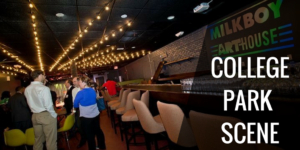 It is across from the College Park Shopping Center, which is only a short walk for people living in Calvert Hills, Old Town, Terrapin Row, Landmark College Park, Graduate Gardens, and the Commons at the University of Maryland. Kung Fu Tea offers a variety of drinks with several options for toppings. The most popular is Tapioca, also known as bubbles or boba. It is made fresh every 2 hours and adds sweetness to any drink making it a fan favorite. Bubble Tea is a trendy drink all over the world and Kung Fu Tea gives consumers the ability to personalize their beverage each time they purchase. Another fan favorite: Mango Green Tea. Kung Fu Tea recently added Thai tea, a more traditional drink, to the menu and quickly became a hit. Inside, there are plenty of comfortable chairs and tables – making the atmosphere perfect for catching up with friends or even doing work. 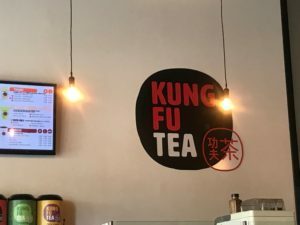 From Teas to Espressos, Kung Fu Tea has an array of items that will appeal to many – in a place that is close for residents and students alike to enjoy.